How do you photograph children? Capturing children with my camera is one of my favorite things to do, but it comes with it’s challenges. Kids are tempermental, kids get cold, they get hot, sometimes they’re not in the mood to smile, kids can be shy, kids are boisterous, kids don’t do what we always ask them to do and…..
kids are awesome, fun and truly glorious photo subjects! Guilty as charged, I am passionate about photographing children! Are you? When I first started learning about photography as a hobby in middle school and high school, one of my first subjects to practice my photography skills and ideas on were the children in my mother’s in-home daycare. I love their silliness, their care free spirit, their difficulty, their genuine innocence and their unpredictable nature. Twenty plus years later, here I am still taking photos of kids, with no plans to stop. Are you looking to improve your own abilities in snapping photos of children? Whether you’re a parent just taking snapshots of your own kids or looking to get into photography for hobby or even professionally, stick a few of these tips into your bag of tricks or photo tool box and see if you start getting even better shots of children. I’m sharing just a handful of tips I’ve found help me gain a little traction and success when photographing kids! Let them be silly (sometimes parents show up to the shoot super stressed and worried about their kids behaving perfectly or concerned they’ll mess up the session, but I try to encourage parents to relax and remind them that kids who are allowed to JUST BE themselves and be silly will most likely produce better pictures and that their personality and temperment is often reflective of the age and current place they are in life). Embrace the silly & you can get silly too! Often times, being a little extra goofy sets kids at ease and allows you those great moments to snap. Sit down with kids, get lower and close to them, to approach photographing them at a few different angles and getting on their level, focusing on their eyes. Shoot them candidly, without worrying to pose them perfectly. Chat with the children you’re photographing, asking them about themselves and their favorites or what they love most about mom or dad. Get rid of your flash and shoot in natural light, morning time or late afternoon. Don’t be afraid to capture movement. Blurred motion with kids isn’t usually a bad thing. Kids move and documenting that energy can make for delightful shots. Keep the background simple. A solid backdrop, a fun pop of color on a wall or even the grass at the park are all perfectly fine for shooting your child subject in front of. Photograph children in Manual Mode on your camera and play with a wide aperture and increase your shutter speed. Raising your shutter speed helps with the often constant movement you face when capturing kdis with your camera. Explore even further, for those uncooperative kid moments, through this awesome Clickin Moms photographer’s resource blog post for bonus ways to get great photos. Have fun practicing and playing for the most authentic and natural photos of children! 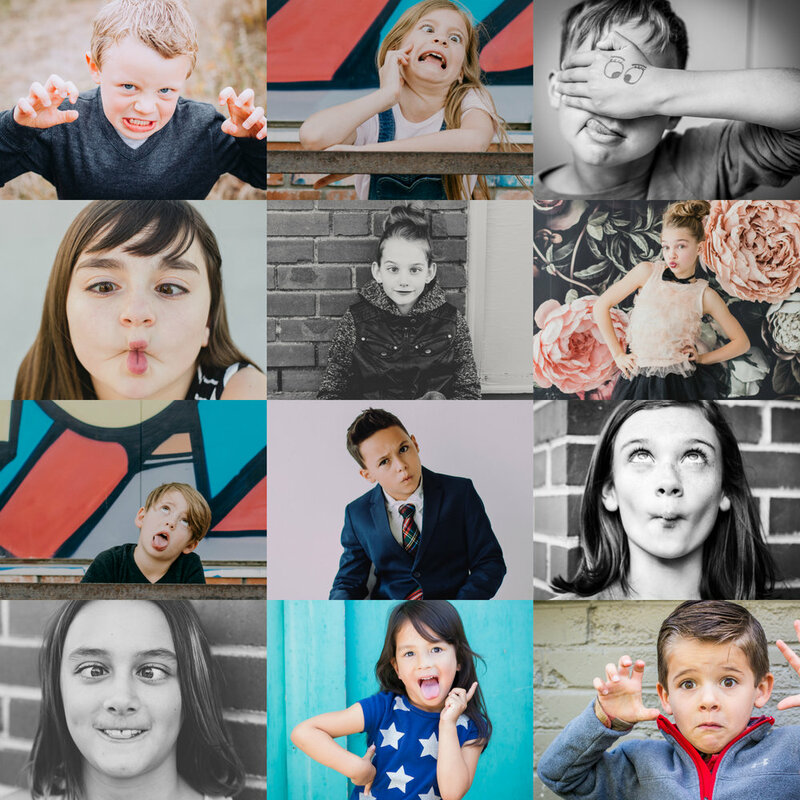 I love to have the kids I’m photographing give me silly faces during our sessions. What other tips can you share that have helped you get the best photos of children? Here’s a handful of my favorite silly expressions from kids I’ve photographed.